Survival trapping animals, insects, birds, and fish have been a mainstay for humankind’s survival for millennium. Survival trapping is important to short and long-term survival. Knowledge and understanding of what trap and where to set help with our success. Spring Pole Snare and Trigger. This two-day Oregon trapping course focuses on the use of trapping in a survival situation. We will learn to make simple but successful primitive traps. Traps used to harvest wildlife for food in an emergency survival situation. Emphasis is on building a strong foundation in the ‘art of survival trapping’ lecture and field study. Snares are traps that use a slip-knot, or noose made from plant fiber or wire, that when tripped tightens around the animal’s neck and chokes it quickly. Deadfalls are traps that use a heavy weight like rocks or logs to crush the animal. 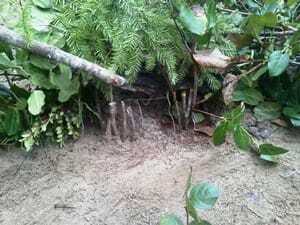 You will be learning how to make and set primitive traps for survival purposes only. We do not trap animals on this course. Traps can kill indiscriminately. We have a responsibility to domestic animals and wildlife. When practicing with traps, do not leave set traps unattended. It’s your responsibility to understand and follow all local, state, and federal game trapping laws.